The California Department of Transportation had to do an emergency project in 2004 to repair concrete that was falling off the Cabrillo Bridge onto state Route 163. Soon after, Caltrans decided to evaluate the entire structure to see what else might need improvement. “We found there were a lot of areas of unsound concrete — concrete that was coming off or wasn’t good anymore that would eventually fall — and that the bridge needed to be retrofitted seismically so it could withstand an earthquake of high magnitude,” said Lou Melendez, Caltrans project manager. These findings led to the $38 million Cabrillo Bridge Rehabilitation and Retrofit Project, which started in September 2013. Construction is now wrapping up with final patches inside the bridge not visible to the public, some metal attachments inside the structure and electrical work. The goal was to strengthen and rehabilitate the Cabrillo Bridge from within — so that Caltrans would not be interfering with the historical aspects of the structure — and extend its lifespan in the event of an earthquake. Construction crews strengthened the walls from east to west, adding an extra thickness to the wall to withstand an earthquake’s force, and then pulled cables from the bottom to the top of the bridge to strengthen the pillars and allow the bridge to move as a unit. 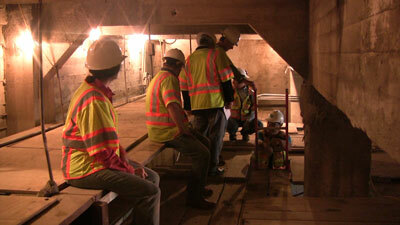 Another important part of the 769-foot-long bridge project has been to repair water damage. “Water was collecting underneath the roadway surface and that water would percolate down through the columns, finding openings and cracks or pockets, and then begin to corrode the steel and concrete,” Melendez said. Caltrans also discovered the bridge is susceptible to atmospheric moisture. One of the more eye-pleasing aspects of the Cabrillo Bridge is the installation of 36 non-dimming LED spotlights. They are placed next to each pillar to light up the arches at night and cost about $500,000. They do not change color, but stay the standard blue of LED lights. Melendez said the software needed to change the colors was too expensive. “The city was in on discussions to light up this bridge at night so that it would be a landmark — an icon that would visible to tourists, to motorists and would be part of the Balboa Park attraction,” Melendez said. Most of the money for the rehabilitation and retrofit came from the federally funded Highway Bridge Program. The city and state contributed the remaining $4.6 million. Melendez said Caltrans and the city saved about $10 million, based on the 50-year life cycle of the project, by modernizing the bridge, rather than building a new one. The project is about $70,000 under budget. The work on the Cabrillo Bridge is a Caltrans project, in conjunction with the city of San Diego. Disney Construction Inc. is the prime contractor; Drake Curtis is the architectural historian. The Laurel Street crossing atop the Cabrillo Bridge closed to motorists for a short time during construction. The street is open to vehicles and pedestrians going in and out of Balboa Park, and state Route 163 is open in both directions underneath the bridge. Museums and businesses in the park remained open during the project work.